Lilija Zeiļa is a master. Potter, ceramicist, artist. She was born in Daugavpils in 1958. For nearly 40 years, her hands have been busy with clay, which continues to set the course of her life and daily routines and yield itself to her will. 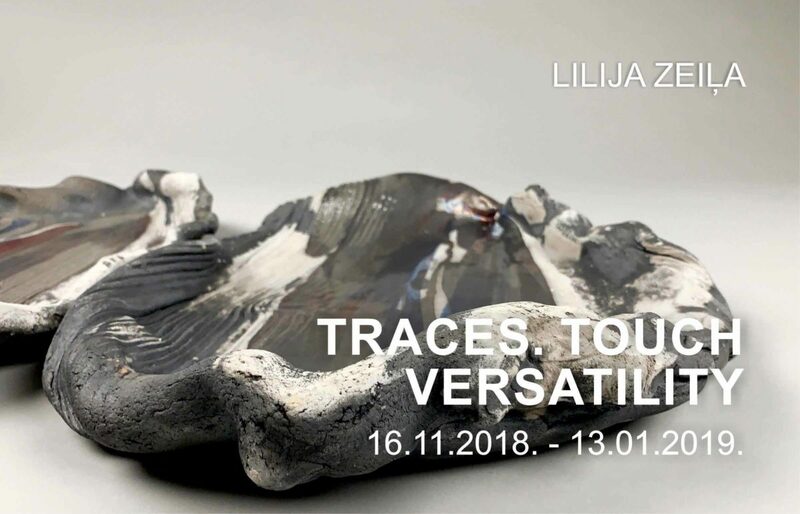 To celebrate her anniversary, Lilija Zeiļa has prepared a solo exhibition featuring three groups of work – Traces. Touch. Versatility. Traces – sculpted stoneware plates with impressive folds and decorative elements inspired by natural textures, which reproduce traces of nature’s own touch in all its diversity. Like Lilija’s other work, they are subtly painted with black and grey, blue and red underglazes and glazes, which are processed with reduction firing to achieve deep, nearly three-dimensional natural landscapes with a poetic feel. Touch – a wall mounted composition, which, like the imprint of an artist’s finger in clay, remains forever in the viewer’s memory as a bright, vivid and masterfully executed artwork – the artist’s creative touch with which she approaches life. Versatility seems to be the fittest attribute to the artist’s creative work in general and, more specifically, to the new set of large-scale ceramic works presented in this exhibition – skilfully executed, multifaceted architectural objects whose vertical vector emphasises their formal expression and pictorial sensuality. Versatility is also the best word to characterise the artist’s personality – she always manages to combine artisanship and art, consistently surprising the viewer. Lilija prefers to call herself an artisan, but what is true artisanship, if not mastery? Mastery to create truly brilliant work, mastery to share experience with students, mastery to be a mother to the family of Daugavpils-based ceramicists. “Ceramics – working with clay – is a way of life, because it consumes my every moment,” says Lilija Zeiļa about her creative work. She became interested in ceramics as a schoolgirl, having visited the workshop of the illustrious Latgalian potter Staņislavs Vilcāns. From 1975 until 1979, Lilija studied at Rēzekne Secondary School of Applied Arts. While there, she also attended the lectures of art theorist Jānis Pujāts at People’s University (1978-1979). She practised traditions of Latgalian pottery, always so dear to her heart, at the workshops of several experienced ceramicists. In the early 1980s, having come home from her studies at Rēzekne Secondary School of Applied Arts, Lilija became actively involved with the newly created art group of Daugavpils-based ceramicists. Lilija exhibits her work since 1981, she has had various solo exhibitions in Latvia and abroad. In 1986, the artist was conferred the honorary title of People’s Master of Applied Arts. In 1996, she took over the leadership of Daugavpils Ceramic Studio “Latgale”. Lilija has inspired and managed several ceramics-themed international projects such as exhibitions and festivals held in cooperation with association “Pottering School”. Studio work has made her a visible presence in Latvia as well as brought Latgalian ceramics to the attention of global audiences. Moreover, Lilija is not only an expert ceramic artist in her own right, she is happy to pass her skills to the younger generation. The artist remains an active participant in exhibitions and international ceramic art symposia where she shares her experience with countless international artists who admire Lilija’s work.